The BMW X3 compact crossover has been redesigned for the 2018 model year. First launched as a 2004 model and now in its third generation, the X3 is one of six xLine crossover models BMW calls Sports Activity Vehicles, numbered X1 through X6. The new X3 M40i, the first M Performance model in the X3 line, is capable of reaching 60 mph in 6 seconds. For the first time on any X model, a three-dimensional Active Kidney grille is installed, flanked by hexagonal foglamps. Additional aerodynamic improvements include underbody cladding, a roof spoiler with aero blades, and air curtains. Otherwise, body modifications are evolutionary rather than dramatic, led by taller glass areas. BMW’s head-up display is 75 percent bigger than in the previous X3, complemented by a 10.25-inch touchscreen and Gesture Control technology. A pre-crash accident detection system is installed, along with three-zone automatic climate control, and reclining rear seatbacks. A 2.0-liter turbocharged four-cylinder engine powers the X3 30i model. Developing 248 horsepower and 258 pound-feet of torque, the base engine mates with an 8-speed automatic transmission. All-wheel drive has been standard, but a rear-drive version will also be offered. In the M40i edition, a sublime turbocharged 3.0-liter six-cylinder engine boasts 355 horsepower and 369 pound-feet, also driving an 8-speed automatic. Like BMW’s other M models, the M40i is fitted with M-grade handling components. All-wheel drive is standard. 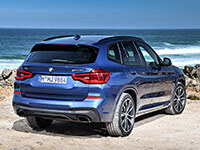 BMW no longer offers an X3 turbodiesel, but plug-in hybrid and battery-powered models are being developed. The 2018 model earned Good scores in crash-testing by the Insurance Institute for Highway Safety. With specific safety options installed, the X3 has been rated Superior for frontal crash protection and Good for headlights, warranting a Top Safety Pick+ award. Ease of child-seat use was rated Marginal. A rearview camera is standard, and the X3 promises excellent outward views. An option group includes lane-departure warning and blind-spot monitoring, as well as forward-collision warning with automatic emergency braking. Another option package adds adaptive cruise control with stop/go functionality, active lane control, and traffic-jam assist. Semi-autonomous driving is possible for brief periods. An M Sport package ($5,300) adds 19-inch wheels, a sport-tuned suspension (with adaptive dampers for $1,000 more), panoramic roof, LED headlights, gray aerodynamic add-on components, and keyless entry. X3 M40i ($54,500) gets the six-cylinder twin-turbo engine and xDrive all-wheel drive. Performance tires are mounted on 19-inch wheels. M Sport brakes and exhaust, plus Performance Control, are standard. The M40i boasts stiffer suspension tuning, four-piston M-spec brakes, variable-ratio electric power steering, and adaptive shock absorbers. The drive-mode selector offers Eco, Comfort, Sport, Sport+, and Individual modes. Except for a taller stance than its predecessor, along with wider air intakes, the X3 hasn’t changed much in appearance. Even though the vehicle sits lower, its glass area is notably tall, expanding outward vision. Moving the front wheels forward has improved X3 proportions. Enlarged taillights and additional glass enhance the rear end. Optional aerodynamic elements tend to make the overall impact more noticeable. Improvements to the reworked X3 are more evident within the spacious cabin, which boasts a cleaner look. BMW’s iDrive control knob sits next to a futuristic joystick-style shift lever. The dashboard may be bracketed by wood or metallic trim. With navigation installed, a 10.3-inch iDrive touchscreen provides a lovely, high-resolution display. Without it, a 6.5-inch screen suffices. In the M40i, a 12.3-inch screen, displaying large numerals and dials, replaces the usual gauges. A complementary 12.3-inch infotainment display is available. Sport seats keep front occupants securely in place. Upholstered in synthetic leather, the front seats are power-adjustable. Heating and cooling are optional. M40i seats incorporate well-padded seatbacks and cushions, promising good support. Lengthening the wheelbase by several inches has expanded interior space, especially in rear-seat legroom. Four adults fit comfortably and can spread out. Headroom is especially abundant. Even with the optional sunroof, six-footers aren’t likely to feel restricted. Rear passengers benefit from 36.4-inch legroom, and wide door openings. The back seat might look flat, but it provides fine support for long journeys, with ample knee clearance for taller occupants. As is often the case, a fifth passenger might feel cramped. Cargo space totals 28.7 cubic feet behind the rear seat, expanding to 62.7 cubic feet with rear seatbacks folded down. In addition to vertical walls, the cargo hold has minimal intrusions from trim pieces, cargo management rails, and a durable covering. In acceleration, ride, and handling, the third-generation X3 stands well ahead of predecessors, approaching the admirable standard long-established by BMW’s 3 Series passenger cars. No X3 is short on power. Smoothly responsive, the xDrive 30i base engine ranks with the best. Power arrives early and effectively, a boon in stop/go traffic. The transmission almost seems to read your mind. In highway driving, the 8-speed downshifts promptly to match engine capability. In M40i trim, the X3 becomes nearly flawless, providing superior poise. Cornering flatly, gripping the pavement tenaciously, able to hit 60 mph in 4.6 seconds, the M40i promises refined, momentous pleasure. Its sport exhaust system emits a delectable beat. Gearchanges arrive earlier in the M40i, with paddles available to supersede the joystick shifter. Performance is marred only by a bit of unwanted tension in the brakes and overly-firm steering. Handling is about as nimble as that of a sport sedan, matched by a comfortable ride. All-wheel drive helps keep the X3 calm and contented on slippery pavement. Eight-inch ground clearance and 19.6-inch fording capability help make off-roading practical. Fuel economy isn’t bad. The four-cylinder xDrive 30i is EPA-rated at 22/29 mpg City/Highway, or 25 mpg Combined. With its twin-turbo six, the M40i is EPA-rated at 20/27 mpg City/Highway, or 23 mpg Combined. BMW’s stop/start system now is a lot smoother than it used to be. 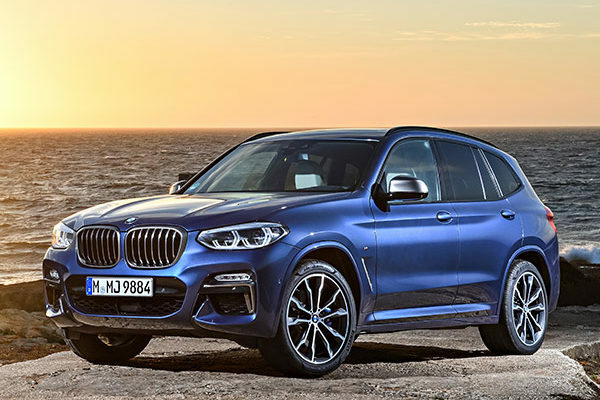 In either form, BMW’s midlevel compact luxury crossover delivers admirably on its promise, blending superlative performance with sedan-like handling and an appealing ride. In terms of affordability, the xDrive30i is the sensible choice. Base-model buyers sacrifice little in either roadgoing behavior or cabin amenities. A number of desirable features are offered only in costly option groups. Driving impressions by Marty Padgett, The Car Connection. James M. Flammang contributed to this report.